Crime and Punishment: DFE data inequality. You’re an idealist, and I pity you as I would the village idiot. I am an optimist, an idealist. I am sure that in the future someone will read this blog with a mixture of bewilderment and contempt but I will be happy that it all turned out ‘fair’ in the end. What is ‘fair’ in education when data (At DFE levels) are the only constant being used to compare schools and there is NO give? Data is what gives the ‘hierarchy’ in education its power to communicate. Data is potent stuff and it is hard to argue against it. So, look at this 2015 Raise data and tell me what you would think about the quality of outcomes? What’s the story? “It ain’t great” I hear you cry! This is my Raise On Line. I can mess about with it using the wonderful On Line Tool (Thanks to @MaryMyatt for support Documents that @jpembroke created) but ultimately this is what others will see before they come in to my school. In fact they will likely paw over it at distance, shaking their heads and wringing their hands thinking – “What ever can we do with this Academy?” So, that is why I got a letter from the Local Authority just before half term that put the Academy in to the ‘At-Risk’ category… Or ‘Amber’ as it is in the West Country. Too right I hear you cry! This is the data for all the children who SAT the SATs. How can they be so different? Now, no one would ever see the above Raise On Line page because this is an edited version. This version does not included the amazing children we educated in our Specialist Provision (Almost all of who had failed Mainstream placements). 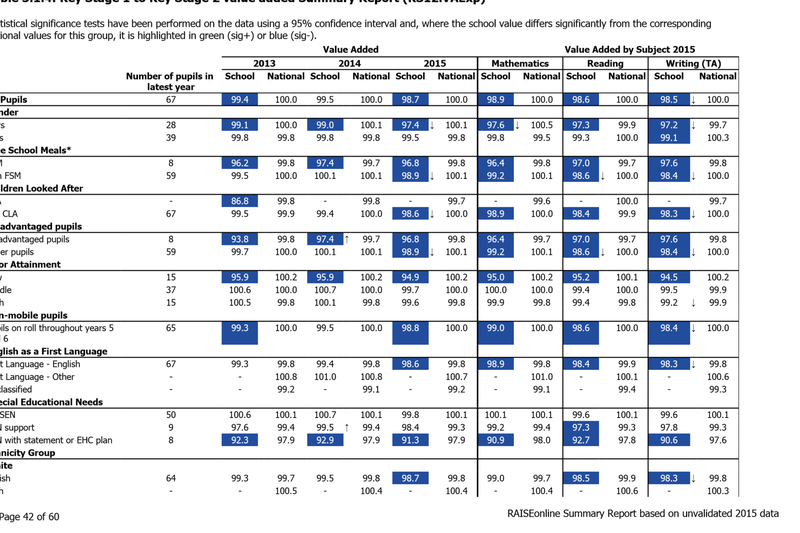 Children who made Upper Quartile progress (The vast majority made the highest P level to P level progress nationally and this data looks great in the Authorities Y6 Specialist Data) and are now in Y7 at Special Schools (Whose data is treated VERY differently because of the complexity of progress within a specialist school setting). None of those children can be a statistic on a National TESTING data sheet. Or am I wrong? It get’s even worse when PROGRESS comes in to the mix. I just count the blue and weep… after which my head spins and I question everything we are doing and why I am a headteacher. I feel like I have committed a crime every time I see this sea of blue and my stomach turns. I am lucky because I am not quiet about this. Why should I be? I have to thank @HartfordSean and @Carter6D for swift and wise words and support over this. They can see through it and they have given me real assurance that there is a more sophisticated way to view this data. I absolutely believe them. It’s others I worry about. This data will go on to my Data Dashboard. Parents will see it (I have over 550). 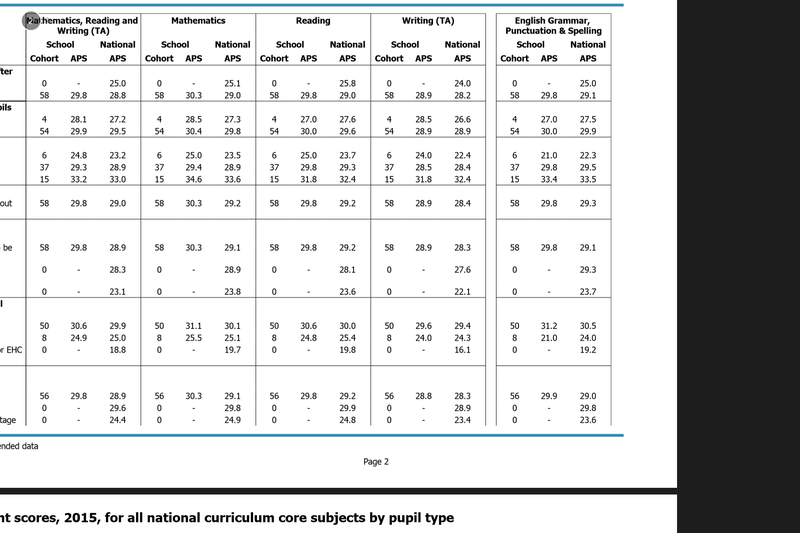 I was at a meeting supporting new heads mentoring when 2 local heads (at another training session) during coffee were looking at the newly published league tables for schools in Somerset (June 15). I am still new enough not to be too known. They were disdainfully pointing out schools in trouble due to results (theirs were undoubtedly very good). One said, “Look at XXXX? (My School). I hear he’s an NLE?” But how is this different to my LA saying the school is At-Risk? Surely they should know better at least? Even if we are an Academy? I bet the National College (who review my NLE status) will no doubt revoke it when they see this data… Or I’ll have to spend hours writing reports and accounting for the ‘real’ picture. I’ll keep you posted on that one but I am too busy to really care any more. I am wise enough to know it’s what you do and not what you are called that ultimately matters. This data sticks and it hurts. I should not have to explain myself every time someone comes in to the school. It’s complex. We should not be afraid to say we are an outstanding place to learn in. We might not be there yet but I am VERY proud of the journey so far! Until I look at some National data of course.. I keep fighting. My Chair of Governors is going to write to @NickyMorgan01 and I will continue to work with those around me including my Local Authority (Who have been very slow to respond and not very helpful at all so far). I will keep believing we are right but look for where the real issues in our data are. (3 levels of progress in Reading – Though how you turn 50% L3 into L6’s (or whatever the 2016 equivalent will be?) is beyond me. Any tips on that one will be much appreciated). So, please support this blog. This is about justice. I am happy for anyone to come out and see the work we do. To look at our data and our provision. To ask difficult questions. But there are too many inequalities in data use and we have to grow up on this issue. It is not just me. There are other schools facing this (@primaryht being one I know of but ANY ONE reading this PLEASE contact me if this rings true to you as well). It is also about Junior schools struggling with Infant data and Y7 teachers looking at SATs data and wondering what has gone wrong. Raise can be really helpful but when it is mad and blind it becomes a very dangerous thing. There was a funny @StarterforFive this week about Twitter profiles and how they are seen compared to the reality… I hope they didn’t see my Ofsted Dashboard! So I’ll leave you with this data (Raise editing tool won’t put GREEN in but I am sure there’s GREEN in there). That’s the data to look at if you want to fairly judge TEST DATA when coming in to our school (Unless you have an agenda of course). I too am in a blue raise school, occasionally we get a green but that is a rare event. I have even started laughing at the data where it looks at 1 child being working towards in ks1 and not getting level 4 or 5 so a scary red box appears. Ms Morgan should come and see how BL**dy hard we are working to even get to floor standard never mind coasting. If I take out andchildren for sen, inward mobility, serious emotional/ behavioural difficulties, PPG and serious family vulnerabilities then the dozen or so in each cohort would make my raise fluorescent green, but I didn’t come into teaching or headship in this school to serve a minority.